ST. GEORGE – Tighter restrictions on distracted driving go into effect across the state at midnight Tuesday. The new restrictions passed by the Utah Legislature earlier this year, are meant to make an otherwise hard-to-enforce law, more enforceable. “The texting while driving law is hard to enforce,” St. George Police Chief Marlon Stratton previously told St. George News. Thus far the law has primarily focused on texting, and officers actually have to see a driver texting, not simply manipulating buttons on a phone. As of midnight, that will change. Violations of the law can lead to a class-C misdemeanor and a $100 fine. If a person is injured due to distracted driving, the driver could face a class-B misdemeanor, which entails a possible $1,000 fine and up to six months in jail. 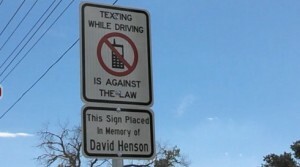 The campaign led to many anti-texting signs being placed in St. George and the surrounding area. They also contacted state Sen. Steve Urquhart, R-St. George, about tightening distracted driver laws in the state. Urquhart, along with state Rep. Don Ispon, R-St. George, sponsored Senate Bill 253 in the state Legislature where it ultimately passed. The City of St. George and the St. George Police Department also created the “Heads Up, Thumbs Up,” campaign to continue to bring awareness to the risk of distracted driving and also highlighted the new restrictions about to become law. If you get caught breaking the law, you’ll be cited, he said. Though the new law does have exceptions that allow someone to have a phone in hand while driving, Stratton recommended drivers keep the phone out of their hands entirely. Ed. Note: Information regarding potential penalties has been corrected. I am generally not in favor of most laws regulating our lives, however, this is a good law. Keep your hands off yours phones while driving, the dangers are unacceptable. Amen to that. You see it everywhere, and it’s not just young people. This ought to make running a small service business just about impossible. Sounds like most people will be playing an unending game of phone tag! I cant wait until it is illegal to speak to the person next to you in a car! Steve, you are a definately a progressive!…next step socialism! If it were put to a vote the populace wouldnt have it! Way to represent the people Steve Urqhart! So making a buck is more important than someones life? Interesting. Wait until you are involved in a crash due to texting. Then we will see what you have to say. He’ll say he was using the GPS on his phone, not texting. That’s why Voice Mail exists. If you get a call while you are driving, let the call go to Voice Mail and answer it when you are safely parked on the side of the road and out of the way of other drivers. 1-2 Minutes is not going to make a difference and people will understand when you answer with something like “I’m sorry I couldn’t answer the phone right away because I was driving and had to find a safe place to pull over so i could call you back”. That’s if they even ask why their call went to Voice Mail in the first place. I doubt they will ask though. One driver, you need two hands on steering wheel and your eyes on the road for safe driving. If you really need to text, just pull over to a safe place (like a parking spot), then you can text. And PLEASE use directional signal to pull over or change lanes! I wish the law went a step further to being completely, 100% hands-free. I ride a scooter every day. At least once a week, a driver will push me out of my lane or cut me off. People need to focus on driving. I was coming back from Hurricane one day a few months ago. Traffic had slowed to an absolute crawl, in the 55 MPH zone, with traffic moving a bit faster in the right lane, than the left lane. Along about the turnoff to Sand Hollow, I discovered why. There in the left lane, riding erratically on a scooter, was this huge guy. (Huge guy, small scooter, think two cheeks and two wheels going down the road.) He was texting while riding, and totally oblivious to everything around him. IDIOT! Next time do what I did…I busted the rear window out of a car with my helmet.